I’m a great fan of the cup of tea. My favourite is Earl Grey made with tea leaves and beaming with bergamot. I don’t like it particularly strong. I take a little milk, but not sugar. 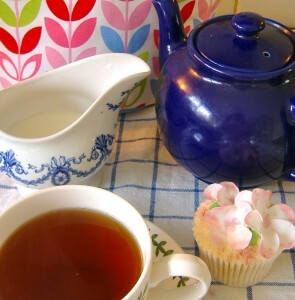 I vividly remember my first proper tea party. I was six. We were invited to Auntie Enid’s tiny flat, where she served the tea in tiny bone china tea cups. I had seventeen cups of tea. It was so delicious, hot and clear against the fine china. There were sandwiches and cake too, but the tea was the star. My husband is also a tea drinker. We like it the same way. I can’t remember who first decided this is the way we like it, but we are in tea-drinking harmony. Which is a good thing, because the rest of the family likes it strong and sweet. Granny was particularly fond of strong, sweet tea, with piece of cake, a scone or two, and a sandwich. She was so clear on her views that she planned the tea service at her funeral! With a list of who was to bake which cake. So I come from a family of tea drinkers and cake eaters. It’s a miracle that I’m not the size of a house. The first thing the District Nurse said to me after Mom died was ‘Shall I put the kettle on?’. That would have been nice except that she had no idea where to find anything, and had so much paperwork to do, it was completely impractical. But it was the thought that counted. I have just been reminded that my blog was conceived a year ago in April. OK, I only wrote one post in April, fully intending to come back often to update. As life would have it, Mom’s illness progressed rapidly and it was nearly three months before I found the time and state of mind to blog again. Now, there’s no stopping me, and I’m pleased to say that this blog has earned a place on Being Cancer Network and on the Talkhealth blog. It fits into a niche audience, being mainly about grief and bereavement. I must say though, that it is also about life, challenges, making a difference, and sometimes it’s about my reflections on cancer and chronic illness in general. This is not an easy subject to write about. It’s not something that we want to talk about when when we’re with friends and family, but I have been encouraged by the number of people who have found my blog and who have found it useful. Grief passes, eventually, and I have found new challenges and happy things to be involved with. I look forward to sharing these with you. What a difference a year makes. Oh, and a nice cup of tea! I enjoyed reading your blog. It covers very real issues in life (and death)with insight and yet a down to earth approach. Oh and I love Earl Grey too – weak but black! Thanks, Jenny. It means such a lot to me to get positive feedback on what could be a very ‘down’ subject.